What are you talking about senpai ? Following Robby's update, there are only posts that are obviously discussing your column. They obviously wanted to discuss those theories after reading your column. Wasn't it the point of the thread ? Are you drunk senpai ? Yes, you did. My apologies I didn't read it properly because I skimmed through it. I had to skim through your column because I was pressed for time at the moment I was reading it. 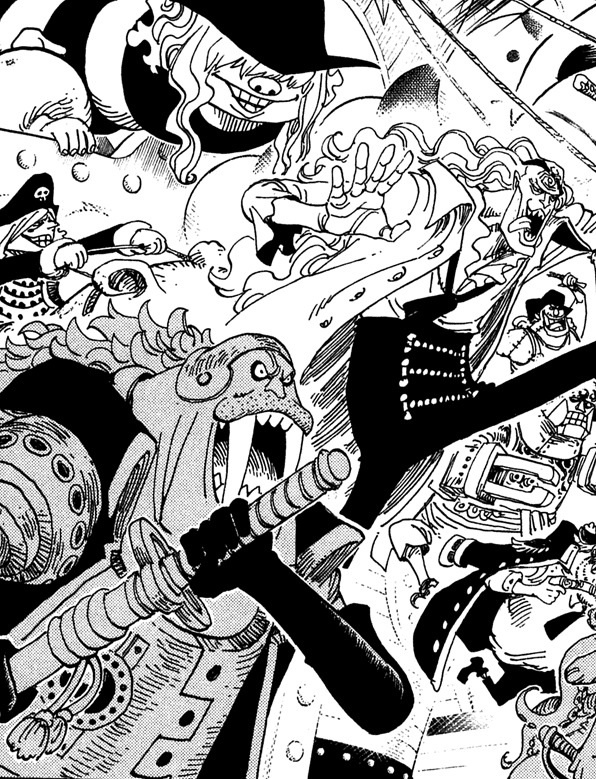 How about that walrus-looking man who was allied with Whitebeard? Good one I had to cheat and go look up his name= Islewan. If we're on the subject of listing obscure potential minks, what about Dirt Boss and Forest Boss from the Gedatsu covers. The mole's even got those beady little eyes. I think they are akin to Eyelashes and are sentient animals. "Hello, Greg, just wanted to let you know as I was rereading the previous chapter section from beginning to start ( currently on 609, lol ) that reading your opinions especially during the ennies lobby arc where a breath of fresh air, i dont know if you'll be posting in the current threads again but i love your reactions and everything lol. " I dunno why Shoujou would lie about his own species. Also, how exactly one gets a gorilla/orangutan sibling pair if they were supposed to be half-human? And aren't horns like buck teeth in the OP world (i.e. they randomly develop them)? I mean, this would open a weird precedent if Caesar or Merry were half-Mink or something, like what about Moriah? Or Kaidou? Or Hannyabal and Saldeath? Last edited by King Cannon; November 8th, 2015 at 08:28 PM. What if Mink family's are just as diverse as Fish folk? You know a Gold Fish Mermaid and Coloncanth(sp?) Merman giving birth to a species of shark merman. I believe when asked in an SBS why people have horns, Oda just went, "horns are cool!" From the beginning I could see Oda just wanting to give horns to people for no good reason beyond them looking nice and then later on as the world developed, decided that people with horns could have mink in their blood. Having horns could just mean they have a grand father or great grand mother who was mink, who knows? As for the ape guys, don't one of them have a tail? I didn't buy that they were human when it was stated to us. Back then Oda could have very well intended them to be strange looking humans and maybe they were raised to think that way. Could be a Pappag like situation you know? There was a very gorilla-looking dude in Foxy's crew that could be tossed into the maybe-mink pile as well - Hamburg. On the subject of horns; it's interesting because some of them look very clearly animalistic(Merry, Caeser) while others I am more inclined to think belong to possibly another subspecies of humanoids or something. Oars, Oars Jr. and Kaido all have very very similar horns and are similarly colossal; Avalo Pizaro could maybe fit into this category as well but he's obviously much much smaller in size compared to the previously mentioned. Magellan's horns were confirmed to be just an accessory as we saw him removed them to use as a weapon at one point, with twin tails underneath - likewise, Saldeath's horns were just part of his hat. And then you have guys like Moriah and Hannyabal with those forehead style horns so they could fit into the (possibly?) mink descended category. 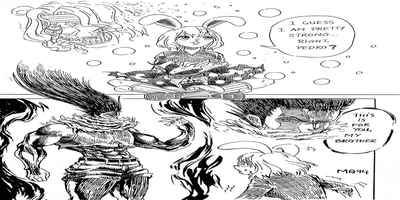 I dunno why Shoujou would lie about his own species. Which is why he wouldn't be lying if he has mixed blood and/or doesn't know his origin. Also, how exactly one gets a gorilla/orangutan sibling pair if they were supposed to be half-human? And aren't horns like buck teeth in the OP world (i.e. they randomly develop them)? That was never stated anywhere but it could easily be mistakenly assumed like many of the surprises Oda keeps in plain sight. Was he ever seen without his hat as an adult? I specifically mentioned them because of their obviously animalistic influences whereas the others are simply horns. Which all said and done, considering the age of the world, could *easily* be remnants of past mink crossbreeds. It's not really weird at all. You guys are amazing with all the potential mink-related individuals. It's amazing what different fans retain. I would never have pulled Islewan from memory. Now that we know that is the fur that makes the minks, the monkey mountain alliance could be just super weird humans or part minks,since they didn't carry fur.Masira's tail can be a weird extra to complete the monkey apperance and Shoujou's statement won't be a contradiction.The same can be said about Captain Gorilla,the coffee monkeys kindnappers in Sabaody archipelago(they also had tails like Masira), the walrus guy who was Whitebeard's captain and the Groggy monsters. As for Saldeath, in the sbs section he was shown without horns when he was a kid unlike Hannyabal, so it's just a wierd hat. Anyway that's how i apply the new Mink perspective into old weird characters anyway.